That'll really be a big help. Hey bushy-you gonna go see him?How about getting the whole gang a group autograph from him?I'm sure we can find someplace to display it(restroom)or some use for it(firestarter),doesn't that just make you feel all giddy(queezy)?I thought that I might just brighten your day! Well it might shut the problem down with his visit, god knows his last visit here paralyzed Brisbane. Well if you were THIS president and had caused world wide conflict wouldn't you have a vast motorcade with lots of security? Especially in countries that don't allow their citizens to have guns. Yes TRBLSHTR...It just sends a tingle down my leg...Ooops. Think I need to to the bathroom. Well, now there is an incident in NY where a white Officer was not charge with the death of a black man resisting arrest because a choke hold was used. Not sure of all the circumstances. The resister was huge and it looks like it took 5 police officers to subdue the "gentle giant". Oh, there will another federal investigation. Here we go again, this time in Arizona. 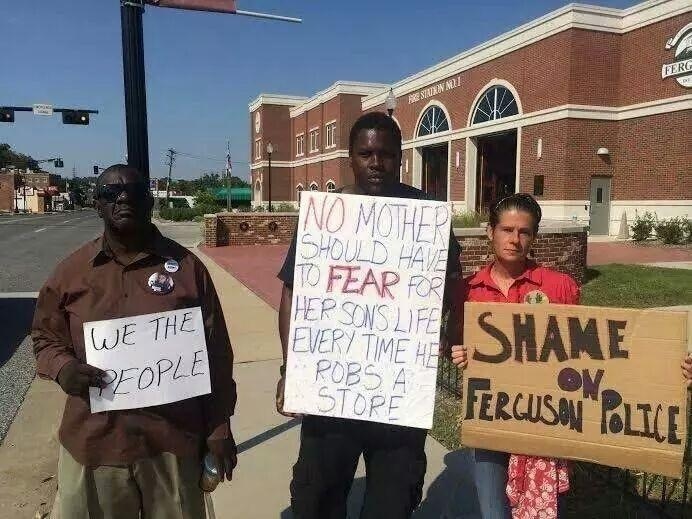 Well I think that maybe she should and maybe she should have taught him better then to rob.............!!!!!!!!!!!!! The common theme, criminal activity, not following police direction, resisting arrest, threatening the police office - and they don't think there are consequences. It doesn't matter what color the skin of the person is - the result is the same. Ferguson, New York and now Phoenix...What the hell is going on...?? I think that the minority groups, and /or the militant activist groups see an opportunity to make some ground, and they are grabbing any and every opportunity they can. I think what we are seeing now is testament to the failure of multi culturism. There is not a lot wrong with individual races, but put a number if them together in the one place and the differences and values come to the fore and trouble ensues. What is the answer...there isn't one anymore because the different races are firmly entrenched within our society. A big thanks goes out to the previous and current Govt and the bleeding heart do-gooders who believe that "oil and water do mix". You know the guy in NY had been arrested something like 30 times before this incident in which he died. Lets all feel sorry for the bad guy... It's not really his fault that he is the scum of the earth taking what others work for and killing those terrible people who own what he takes. When one of those terrible people actually defend themselves and their property the poor bad guy is a victim of a violent society and the terrible person who protects himself is wrong to do so. Well, If I shoot a thug in the act of a felony against myself or those I love it might prevent him from getting the "help" he needs but he won't harm anyone else. That truly helps society.